PCR stands for polymerase chain reaction, a molecular biology technique for amplifying segments of DNA, by generating multiple copies using DNA polymerase enzymes under controlled conditions. As little as a single copy of a DNA segment or gene can be cloned into millions of copies, allowing detection using dyes and other visualization techniques. Developed in 1983, the process of PCR has made it possible to perform DNA sequencing and identify the order of nucleotides in individual genes. The method uses thermal cycling or the repeated heating and cooling of the reaction for DNA melting and replication. As PCR continues, the “new” DNA is used as a template for replication and a chain reaction ensues, exponentially amplifying the DNA template. 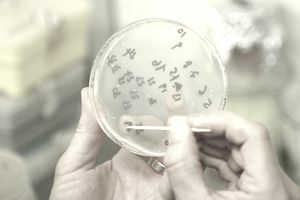 PCR techniques are applied in many areas of biotechnology including protein engineering, cloning, forensics (DNA fingerprinting), paternity testing, the diagnosis of hereditary and/or infectious diseases, and for the analysis of environmental samples. In forensics, in particular, PCR is especially useful because it amplifies even the smallest amount of DNA evidence. PCR can also be used to analyze DNA that is thousands of years old, and these techniques have been used to identify everything from an 800,000-year-old mammoth to mummies from around the world. Initialization: This step is necessary only for DNA polymerases that require hot-start PCR. The reaction is heated to between 94 and 96 °C and held for 1-9 minutes. Denaturation: If the procedure does not require initialization, denaturation is the first step. The reaction is heated to 94-98 °C for 20-30 seconds. The DNA template’s hydrogen bonds are disrupted and single-stranded DNA molecules are created. Annealing: The reaction temperature is lower to between 50 and 65 °C and held for 20-40 seconds. The primers anneal to the single-stranded DNA template. The temperature is extremely important during this step. If it’s too hot, the primer might not bind. If it’s too cold, the primer might bind imperfectly. A good bond is formed when the primer sequence closely matches the template sequence. Extension/Elongation: The temperature during this step varies depending upon the type of polymerase. The DNA polymerase synthesizes a completely new DNA strand. Final elongation: This step is performed at 70-74 °C for 5-15 minutes after the final PCR cycle. Final hold: This step is optional. The temperature is kept at 4-15 °C and strops the reaction. Exponential amplification: During every cycle, product (the specific piece of DNA that is being replicated) is doubled. Leveling-off stage: As the DNA polymerase loses activity and consumes reagents, the reaction slows. Plateau: No more product accumulates.